​which contain more than 5 million living plant collections. Where would the botanical artist be without the botanical garden? Such gardens are an important source of plant material unless an artist focuses on portraying plants commonly found in domestic gardens. A number also run botanical art schools or courses for the aspiring botanical artist. Finally they are a source of employment for the professional botanical illustrator. Many gardens offer opportunities for learning more about plants and access to specimens of different species. Some have archives and/or galleries of botanical art. Many of the botanic gardens associated with universities and medical schools grew out of old Physic Gardens maintained by the monasteries. You can read more about Botanical Gardens from the past on my web page 'Old Botanic Gardens in London"
Jennifer A. Heise has summarised characteristics of Medieval Gardens and her article has an extensive bibliography. What is the correct term - Botanic Garden or Botanical Garden? 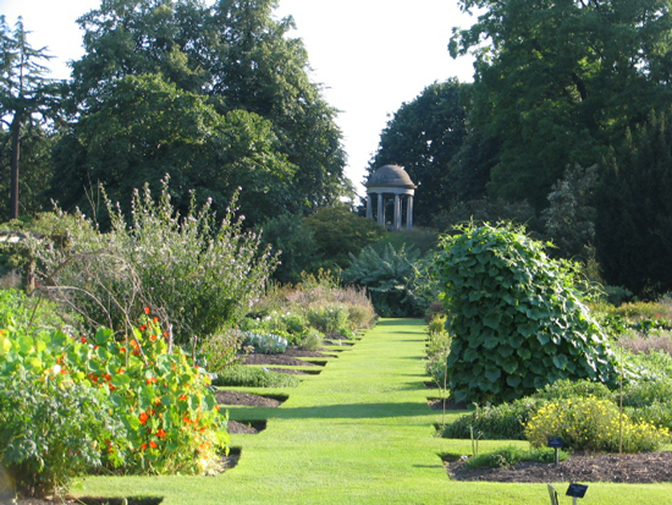 The term Botanic Garden is mostly used for the older / earlier Botanic Gardens. Newer gardens are more often known as Botanical Gardens. While the names are often used interchangeably, the status of the older garden sometimes requires correct referencing - and this only happens when English is used. Garden of Simples - term used for the oldest botanical gardens, those used by monks to grow herbs for medicinal use. A 'simple' is a herb used on its own in medical treatment. "Botanic gardens are institutions holding documented collections of living plants for the purposes of scientific research, conservation, display and education." The Order Beds - of Plant Families - at the Royal Botanic Gardens at Kew. According to Botanic Gardens Conservation International - the criteria used for the definition of a botanic garden are as follows. - Maintanence of research programs in plant taxonomy in associated herbaria. What is a Botanic Garden | Changing Perspectives - What is a Botanic Garden and how is it different to a country house garden or a park?